Valencia, CA (May 6, 2014) – PDC Healthcare, the global leader of innovative identification solutions, announced today the release of its new TEMPbadge® Visitor Management System that allows hospitals to quickly identify visitors, complying with Joint Commission requirements while helping to deter hospital violence as part of an overall security protocol. Nurse stabbings at two southern California hospitals were the most recent to make national headlines, highlighting the need to make identifying visitors an important measure to help protect the safety of patients, personnel, and visitors. As public institutions, hospitals typically usher in dozens or hundreds of visitors per day. Workers in healthcare and social assistance settings are five times more likely to be the victim of a non-fatal assault or violent act than the average worker in all other occupations combined, according to the United States Bureau of Labor Statistics. 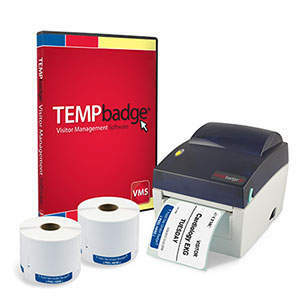 The TEMPbadge® Visitor Management System from PDC Healthcare includes the easy-to-use Visitor Management Software, a durable TEMPbadge® Direct Thermal Printer, and 1,000 Self-Expiring Badges so hospitals can quickly check-in visitors and print badges on demand. As an added safety feature, a red “VOID” alert appears on the self-expiring badges approximately 16 hours after application, so the badges cannot be reused. The turnkey solution does not require IT integration and the user-friendly software can be customized to fit each facility’s specific needs. The Joint Commission issued a Sentinel Event Alert #45 to prevent violence in the healthcare setting, prompting hospitals to protect their patients and staff from the steadily growing crime rates in healthcare facilities. According to a study by the Foundation of the International Association for Healthcare Security and Safety, 98% of all healthcare facilities experience violence and criminal incidents. OSHA has also reported that nearly 1/3 of nurses are subjected to assault at least once per month. The TEMPbadge® Visitor Management System provides peace of mind to staff, as they can be assured visitors have followed safety protocols when visitors are seen wearing a hospital-issued ID badge. The system also complies with government and accreditation regulations, including Joint Commission, OSHA, and HIPAA. PDC Healthcare is offering a free 15-day trial of the TEMPbadge® Visitor Management System. For questions on how to receive a free trial, call 800.435.4242 or visit us online at www.pdchealthcare.com/tempbadge. TEMPbadge® ID has been a Brady-owned brand of self-expiring badges, parking permits, wristbands and other visitor management products for more than 30 years. The brand currently holds 15 issued patents and 3 pending patents on products and production processes. TEMPbadge® products are used by thousands of organizations worldwide, including Fortune 500 corporations, government agencies, healthcare facilities, airports, schools, financial service organizations and pharmaceutical companies.